Silly Bee's Chickadees: One World. One Flag? So. I'm not a very political person and I don't feel like opening a forum about why we should or should not create a world flag. But, I came across this article and thought it was an interesting design challenge. I get a bunch of design-related magazines and e-zines and this item came from Liquid Treat. 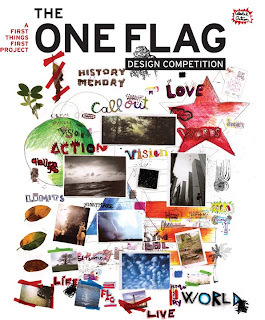 A nonprofit activist organization of designers--professional and students-- and other creative types called Adbusters sponsored a competition to come up with a "world flag" and received more than 1,000 entries that "embody the idea of globalism." Some of them are thoughtful, some of them are militant and some of them are downright ugly. Frankly, I think if we asked kids around the world, we would get more pure, unpretentious designs, but I didn't come up with this deal. So, click on the One Flag poster above to check out the finalists and vote on your favorite flag which will be produced and sold, I guess. You will be able to see the winning flag flying high over the winner's mother's house. Voting closes March 17. P.S.- Not to try to bias your voting, because I don't know any of these people anyway, but I think the "Humanities Mark" is a bit of a cop-out because I've seen it used by at least 6 or 7 nonprofit groups already. Just me, keepin' it real. P.P.S.- In case you are wondering, if I got in on this flag thing earlier, I think this would've been my entry. Because nothing brings the world together like David Hasselhoff. the Hoff is the bomb!